We all know the holidays as a time when cookies and other delicious sweets start appearing more in our diets. For me, getting to bake cookies is one of my favorite things to do during the holiday season. Growing up, my mom, sister, grandma and great aunt, used to all get together and spend the entire day baking a boat load of cookies. We all had our favorites that we’d want to make and it wasn’t uncommon for each person to be working on a different kind of cookie all at one time. We’d plan it out accordingly so that we didn’t have two cookies going at the same time that needed different temperatures. We were like a well oiled machine. As we got older, it became harder for all of us to get together and make a whole day out of it, but my mom, sister and I still try to at least bake a couple different kinds when we’re all together – or whoever is together. Because it was such a tradition growing up, it’s never been the same to bake alone. And turns out this year, it just lead to a bit of a disaster. I tried making a few cookies that just didn’t turn out as well as I wanted and thus, I deemed them not good enough to give as gifts or share with anyone other than people who happen to stop (or live in) this apartment. 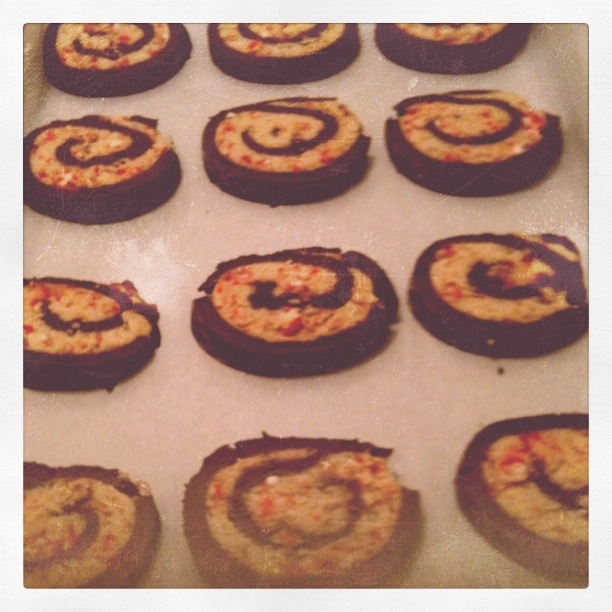 My favorite Christmas cookies are Peanut Butter Blossoms and Chocolate Peppermint Pinwheel Cookies (an Alton Brown/Food Network recipe). The pinwheel cookies are new as of the last few years, but growing up Peanut Butter Blossoms were a family staple and one my sister and I would often argue over baking. We learned we had to split the task and make sure we both got to put equal Hershey kisses on the cookies when they came out of the oven. (There’s just something about that “shhh” the cookie makes when you stick in the chocolate kiss). Anyway, I’m hoping that when I get home, my sister and mom will have saved a bit of baking for me to join in.